Kayla Angst has been a skin care specialist since 2008. She completed her aesthetics training at the Palm Beach Academy of Health and Beauty. Kayla has comprehensive experience and knowledge in all major areas of aesthetics, including customized medical facials, chemical peels, Microdermabrasion, Derma-needling, LED Light Therapy, High Frequency and Micro Current. She also offers extra services such as eyebrow and eyelash tinting. Kayla specializes in addressing skin conditions such as acne, aging, and sun-damaged skin. She believes that each facial should be tailored to fit your unique skin type. With having such a passion for the industry, she continues to have extensive training each year to ensure she is up to date with the latest and best skin care products and services. Supriya Aesthetic Dermatology offers a warm, caring, and comfortable environment where a full line of therapies are available to rejuvenate your skin’s natural beauty and restore a youthful, healthy appearance. We employ the latest advances in aesthetic science to promote skin renewal, reduce the signs of aging, and help you look your best at any age. Kayla is committed to the highest possible level of care. She will make sure that your experience is relaxing, caring, and exceeds your expectations, and will help you look and feel better than you ever imagined. With a full line of treatment options available, Kayla will be able to find the right one to achieve your desired results. 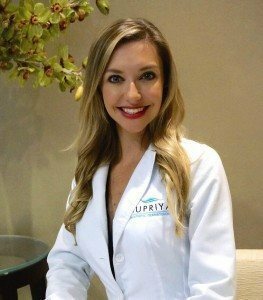 Whether you’re tired of looking tired, frustrated with acne, dealing with premature wrinkling and skin damage from excessive sun exposure, or simply in need of a lift, Kayla can not only offer the solution, but she knows how to get things done in the least invasive, most comfortable, and most effective way possible. Her goal: you—at your very best! Come in for a complimentary skin care consultation. Kayla can help create the perfect skin care regimen for you!